Here is an example of clever cat conservation. It seems to me as if it is a piece of enlightened lateral thinking. The cat concerned is the snow leopard, a startlingly beautiful and elegant rock climber. And how have the conservation experts gone about helping to save this cat in the wild? By vaccinating cattle. It wasn't immediately obvious what was going on to me but it gradually dawned on me. I am talking about the Snow Leopard Trust's livestock vaccination program in the most northern district, Chitral, of Pakistan's North West Frontier that borders China and Afghanistan. Chitral North Pakistan - photo by dave watts. 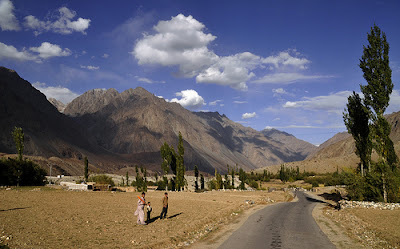 It is one of Pakistan's most rugged regions. 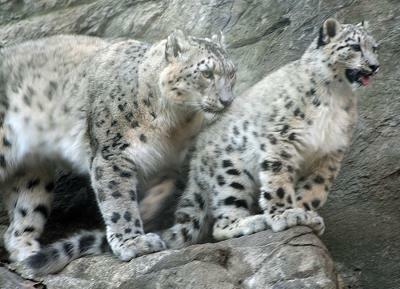 The area represents about 30% of the snow leopards range in Pakistan. The snow leopard sometimes preys on farmers' livestock. The farmers retaliate and kill the snow leopard. But despite that they want to protect or are willing to protect this magnificent cat. What to do? Well diseases kill far more cattle than the snow leopard. So a vaccination program in which the local people participate means that they lose far less livestock, which in turn means that they can accept the odd loss from a snow leopard attack, which in turn means the people can protect the snow leopard and make a better living, which means all the parties gain. This is clever cat conservation. There should be more, much more like it. A recent news item (China.org.cn) refers to another piece of clever cat conservation. An insurance program which covers the loss of cattle to the snow leopard has had a remarkable impact on snow leopard numbers in Kanchanjunga Conservation Area (KCA) in northeastern Nepal. The population of this gorgeous cat has risen from 32 to 45 in one year. May these thoughtful conservation programs continue and produce more success and be repeated in other places and for other endangered wild species. The newsletter (Fall 2009) of the Snow Leopard Trust (trust) informs us that vaccination programme is going to be expanded thanks to donations from Blue Moon Fund and Disney Worldwide Conservation Fund. The program has been successful. Sales of livestock have increased bringing a higher income (up 23%) to a village called Parsan. The trust reports that in the area over the period 2001 to 2007 there has been an increase of 8% in signs of snow leopard presence. Fantastic. I would hope that the figure of 8% could be improved for the future and no doubt an extension of the program is intended to achieve this.